Departing from Taumarunui only, experience the first 16km of the Forgotten World Railway. Travel through 5 tunnels including the longest tunnel (1.5km) on the line before stopping for light snack and returning on the rails. The 20 Tunnel experience will transport you back through history, and get you home in time for dinner. This is a full day and more than 80km of total immersion into the true stories and tall tales woven into this unique landscape. Tour departs the FWA Taumarunui Depot at 7.30am and will arrive in Whangamomona approx 3.45pm - The "Same Day" shuttle picks you up after a quick look around Whangamomona and delivers you back to our Taumarunui depot at approx 6.15pm. start in Taumarunui and have your vehicle transferred to Whangamomona to continue your journey from there. The 20 Tunnel experience will transport you back through history, and get you home in time for dinner. The 20 Tunnel 2 tour begins in Taumarunui at 7:15 pm. You will board our shuttle bus to travel to Whangamomona by road. After a quick look around the Whangamomona village you will receive your safety briefing at at the Whangamomona Station before heading off along the rails to finish your tour at our Okahukura. From there you will board the shuttle bus for the 10 minute ride back to our base in Taumarunui. 1. Staying the night at the Whangamomona Hotel before the tour and booking a vehicle transfer so that your car is waiting for you in Taumarunui when you get back to our depot. Just let us know if you would like us to book accommodation for you. 2. Driving up from Taranaki on the morning of your tour and meeting the tour at the Whangamomona Station at 9:30am. Do allow sufficient time for a look around Whangamomona. It is worth it! After your tour stay the night in Taumarunui and book a non- standard shuttle back to Whangamomona the next day. The shuttle will depart for Whangamomona at 7:30am. 3. Driving up from Taranaki on the morning of your tour and meeting the tour at the Whangamomona Station at 9:30am. Our free of charge Same Day shuttle will return you to Whangamomona around 7pm. Enjoy the best of both worlds travelling by RailCart on the Forgotten World Railway through 10 tunnels and via Jet boat along 23km of the Whanganui River. 7:30am departure: Travel through 10 hand dug tunnels and over 20 bridges before enjoying your waiting lunch at the old Tokirima Station. 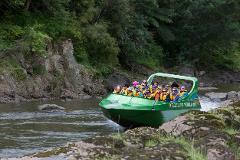 After lunch you will be shuttled down to the Ohinepane landing to the waiting jet boat for an exhilarating 23 km ride back up the Whanganui River to Cherry Grove in Taumarunui. 10:30am departure: Our shuttle will take you down to Cherry Grove to jet boat 23km down the Whanganui River to Ohinepane Landing.From there you leave the river and board our shuttle to have lunch at the old Tokirima Station. After lunch, board your RailCart and travel through 10 hand dug tunnels and over 20 bridges as you make your way back up the line to Okahukura. From there it is a 10 minute shuttle back to our Taumarunui depot. Enjoy the best of both worldTravel 23km down the magnificent Whanganui River to be picked up by our shuttle and taken to the old Tokirima Station. There you will board your RailCart and to travel the 30 km of rail line back to Okahukura. Leave the gentle plains of Taranaki and enter the Forgotten World. Departing from Douglas, just east of Stratford, the railway winds its way into the hills towards the self-proclaimed republic of Whangamomona. A two part expedition. The first day is our 20 Tunnel tour which will transport you back through history to the Republic of Whangamomona! 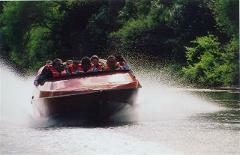 The second day you'll be jet boating the Whanganui River exploring historical sites and scenery. Join us for a Forgotten World Expedition. 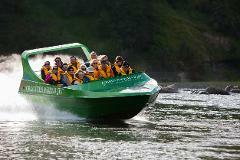 A day on the rails and a day jet boating along the Whanganui River on the longest commercial jet boat tour in the Southern Hemisphere. The Expedition is two full days and includes one night accommodation. RailCart down the Forgotten World Railway to the Republic of Whangamomona, more than 80km of total immersion into the true stories and tall tales woven into this unique landscape. Stay the night in the Republic. The second day after a spectacular helicopter flight over the Whanganui National Park to the Bridge to Nowhere, you'll be jet boating up the Whanganui River exploring historical sites and scenes, including the "Bridge to Nowhere" on the longest commercial jet boat tour in the Southern Hemisphere. Along the way stopping for morning, afternoon tea and lunch. This is the longest commercial jet boat tour in the Southern Hemisphere. - 20 tunnel tour - Taumarunui to Whangamomona. including morning and afternoon tea, lunch and local guide. - Accommodation at the historic Whangamomona Hotel including dinner and full cooked breakfast. - 25km helicopter flight (weather permitting), the alternative will be to drive the Forgotten World Highway to the Whanganui River. - Returning to Taumarunui 4:30pm. Unplugged yet "still on the line", you travel the full 142 kms of the Forgotten World Railway. Day 1 travel from Stratford to Whangamomona. Day 2 travel from Whangamomona to Okahukura. All 24 Tunnels & 98 Bridges, the ultimate experience! The history of this unique landscape will resonate as you absorb the stories and relive the memories of New Zealand’s pioneering past with this two-day journey back in time. Unplugged yet still ‘on the line’ as you travel the entire 142km from Okahukura to Stratford or Stratford to Okahukura with an overnight stay (additional to tour) in Whangamomona. You’ll go through all 24 tunnels, cross all 98 bridges and see the remnants of the original settlements along the line – the ultimate experience. You can continue on your travels from here, talk to us about a vehicle transfer, or we can help you organise a return shuttle to your departure point. Morning tea, lunch and afternoon snacks are provided on both days. Venture through white water rapids, take in the spectacular scenery of both rural farmland and the hidden depths of the Whanganui National Park. Learn about the unique history of the river from early Maori settlement through to the establishment and demise of European farming communities. Your ‘Bridge to Nowhere’ journey departs from the upper most region of the Whanganui River in Taumarunui. Travelling down stream you’ll pass through King Country farmland and bush clad hills into the middle reaches of the Whanganui National Park with it's deep gorges masked in native bush, fern encased banks, caves and waterfalls. Sometimes skimming through the bubbling rapids, sometimes gliding over water as smooth as glass, observe remnants of the days when the river was used by steamboats and as the main means of transport of early settlers. Arrive at the Mangaparua landing - gateway to the infamous Bridge to Nowhere. Take a leisurely and beautiful 40 minute native bush walk to the bridge. Here you can sit and relax, have your supplied picnic lunch and imagine what it must have been like to live in this isolated area as an early pioneer. The return journey is just as exciting with time to enjoy the scenery and plentiful bird life. Arrive back in Taumarunui approximately 4:00pm. Child is considered 15 and under. Take in the spectacular scenery of both rural farmland and the hidden depths of the Whanganui National Park. Learn about the unique history of the river from early Maori settlement through to the establishment and demise of European farming communities. Explore the Taranaki end of the Forgotten World! Travel the line between Stratford and NZ’s first Republic, Whangamomona. This one day tour includes views of the spectacular dormant volcano, Mt Taranaki, and a visit to an organic farm. Depart Stratford and travel by road to Whangamomona. Enjoy a walk around the Republic and maybe a coffee at the Whangamomona Hotel before heading to the Whangamomona Station and your waiting Railcart. Accommodation in Stratford - We can book your accommodation in Stratford for either the night before or the night after your journey on the rails - or for both nights! Arrive at Whangamomona about 3.30pm to explore this wee republic before boarding your same day return shuttle to journey by road, back to Stratford. Or why not extend your stay overnight and enjoy the hospitality of the republic. 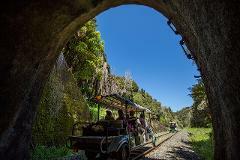 20 Tunnel tour with dinner, bed and breakfast at the iconic Whangamomona Hotel, and our shuttle to your starting point. Your RailCart tour departs from our FWA Taumarunui Depot at 7.30am and will arrive in Whangamomona approx 3.45pm - make your way to the iconic Whangamomona Hotel, where your dinner bed and breakfast awaits you. After a leisurely breakfast board our shuttle at approx 9.45am for your return journey to Taumarunui. Shuttle departs from our FWA Taumarunui Depot at 12.30pm and will have you in Whangamomona approx 3.45pm - make your way into the iconic Whangamomona Hotel, where dinner, bed and breakfast awaits you. After breakfast meet your tour guide and fellow passengers in the Hotel lobby at 9.00am, for complimentary coffee/tea/juice before a leiurely stroll along the main street of Whangamomnona to the Railway Station to board the RailCarts for your journey back to Taumarunui.